On Aug. 8, the board voted unanimously to place the agency’s manager, Bill Worrell, on paid administrative leave as SLO County District Attorney’s investigators delve into the agency’s long-neglected oversight of Worrell’s spending autonomy. IWMA’s legal counsel, Ray Biering, informed the board that Worrell would not be receiving an IWMA funded retirement, according to several board members. Consequently, the board then voted to allow Worrell to “retire” early, on Sept 7. In 2013, the state passed the California Public Employees’ Pension Reform Act, a law that requires public employees who are convicted of a felony to forfeit public retirement benefits. In 2006, the IWMA entered into a contract with Worrell that provided retirement benefits. In an Aug. 21 “cure and correct” letter to the board, attorney Stew Jenkins asked that the issue of Worrell’s retirement be revisited because it was not properly placed on the agenda. Jenkins also questioned why the board was provided inaccurate information. Several days later, Biering informed Jenkins that the board would reexamine the issue in open session at a special meeting on Aug. 29. Jenkins also asked the IWMA board to invite the county district attorney to attend the corrective meeting. “In that manner, you may inquire and receive legal information concerning available disciplinary matters that may, can or must be applied to forfeiture of publicly funded retirement, deferred compensation, or other fringe benefit if a determination that public funds managed by the employee have been misappropriated,” Jenkins wrote. The board will meet in special session at 1:30 p.m. Aug. 29 in the county supervisors’ chambers to decide Worrell’s retirement future. What does it say about the Board? The board are the guilty and responsible ones. What board retires someone from an agency, with full benefits, who is under criminal investigation for stealing from the agency? With potentially 100 million in grant money over 20 years gone and unaccounted for, the board is looking very guilty. When you pull one card from a house of cards, what happens? This whole house is coming down. The board had better get themselves a team of real lawyers, not the ones under criminal investigation. This is why they need a true forensic auditor. A normal “audit” isn’t going to go digging very deeply if records are missing. A forensic auditor can re-create many of those records going back many years – the information is out there in bank records, tax filings, contracts, invoices, bills of lading, manifests, weigh tickets, and a host of other records that can be collected and used to track every dollar that’s worked through the IWMA over the last 20 years. With tens of millions of dollars passing through the agency and no one closely watching, there has a been a lot of opportunity for diversion of dollars. The IWMA Board members (made up of local politicians), who were charged with the responsibility of oversight of the IWMA staff operations, apparently fell asleep on the job and had no clue that any of these shenanigans were going on. So, it falls to this same Board to choose an interim manager and an auditor, and oversee the “investigation” into what happened. I’m just SURE that the truth will be brought forward. Isn’t there some way – ANY way – to have some outside authority appoint the interim manager and hire and oversee the auditor so there is at least some chance, however small, that we might actually find out what happened and maybe even prevent it from happening again? Can’t we cut this obviously incompetent Board out of the equation and have the investigation run by an independent authority? 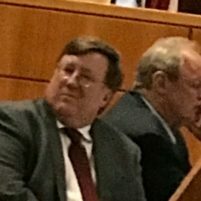 I know the DA is investigating, but, come on – Ray Biering was the County Counsel for years and is certainly buddies with the DA folks. I doubt that Biering did anything illegal, but he also had an oversight responsibility and would certainly like to see this quietly go away. The current situation is just designed to allow this all to quietly disappear in the near future. Gosh this must be terrible for these guys. They were cruisin’ right along for all these years with no one watchin’ or payin’ a never mind, then suddenly—WHAM! People are snoopin’ everywhere, and questioning the operating procedures they’d grown comfortable with. It’s obvious the oversight hasn’t quite sunk in with Biering, he felt comfortable enough to attempt to sneak a fast one by the board with false information regarding Worrell’s retirement. Terminate every single one of them with cause and then follow the money. Does the Grand Jury have jurisdiction on this, too? We need to have a lot of investigations going, as it will make it that much harder for them to outmaneuver all of them. Don’t waste time with SLO county’s toothless Grand Jury………. The real news will be when Dow reveals the hidden credit card expenditures to the public. 1/2 million in charges that can’t be shown should prove to be of great interest to the public.